The championship will be awarded based on points earned at events held during a one-year period from November 1 to October 31 of the following year. All events will be considered as part of the year in which the event weekend started. 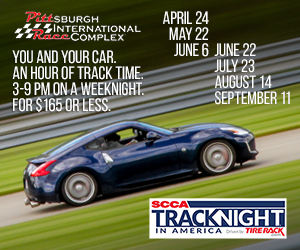 The championship is open to all Steel Cities Region, SCCA members in good standing. This includes drivers who are also members of other regions, but are dual members with Steel Cities Region. Drivers must run at least one Steel Cities Region event to be eligible for the championship. Championship points may be earned at any SCCA sanctioned Club Racing event, at any track, regardless of the organizing region or division. Points cannot be earned at Pro events or events not sanctioned by SCCA. Events sanctioned by more than one body are included, but only races operated under SCCA Club Racing rules can be used for points. Points are earned for regular, single-driver races, including sprints and Enduros, but not for qualifying, time trials, or for races conducted as part of a Driver’s School. Points cannot be earned for events in which multiple drivers participate as part of one team or for “gimmick” races in which there is no clear finishing order (for example, no points can be earned for a pursuit race). Results of non-racing events, including SCCA Solo and Rally events, will not be considered. When a race weekend event includes multiple races, whether operated under one or multiple sanctions, any race may be used for points, including “bonus” races. Regardless of the number of races in an event weekend, or the number of classes in which a driver is entered, at most two races per event weekend may be used for points. Points are earned for a race based on the driver’s finishing position in class, according to the table below. Points are awarded only for cars completing at least half of the race, as described in GCR 6.10.3.A. In addition, each driver earns additional points for a race based on the number of competitors racing in that class, according to the table below. Only cars considered to be starters under GCR 6.10.2 will be considered. The driver accumulating the most points during the competition year will be declared the champion. Only each driver’s 7 best events (that is, the 7 events earning the most points) will be considered for championship points. In the event of a tie in points, the winner will be determined according to the greatest number of wins, followed by the greatest number of 2nd place, 3rd place, and so on. The pointskeeper will follow results from SCCA Club Racing events held in the Northeast Division, events at select nearby tracks, and from the SCCA National Championship Runoffs. Results from these events will be automatically incorporated into the points standings. Drivers competing in other events should notify the pointskeeper to be sure the event is included. There is normally no need to submit copies of results; however, you may be asked to do so if we are not able to obtain them by other means. Current points standings will be posted from time to time on the Steel Cities region web site. Drivers are encouraged to check the standings regularly and report any errors to the pointskeeper. Any pointskeeping errors will be corrected as soon as possible. The pointskeeper can be reached at jhutz@cmu.edu.